The plan to turn 10,000 payphone kiosks into Wi-Fi spots would put 10 times as many fast hotspots in Manhattan than the Bronx, officials say. 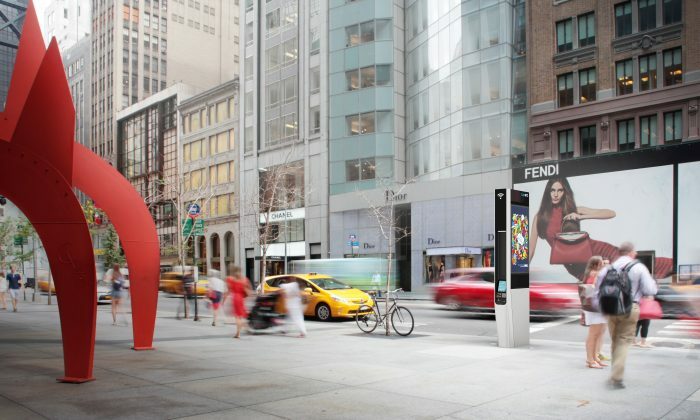 Mid-November, the city revealed the winning design of the Wi-Fi kiosks slated to replace the payphones. If the plan is approved, the first Wi-Fi kiosks will be installed by mid-2015. The kiosks would be evenly distributed by borough, and have speeds up to 1 gigabit per second—enough to upload a thousand photos in 12 seconds. However, that only applies to kiosks with advertising. Kiosks without advertising would receive speeds of 100 megabits per second, according to the contract. The plan needs to be approved by Comptroller Scott Stringer and the five borough presidents, who sit on the Franchise and Concession Review Committee (FCRC). On Dec. 3, the officials released a Five Borough Broadband Bill of Rights. They want the five points to be included into the city-wide Wi-Fi kiosk plan, which they will discuss at an FCRC hearing Dec. 8. “LinkNYC leaves too many questions unanswered and too many New Yorkers out of the Internet fast lane,” Stringer said in a press release. The first point is that the contract should provide equal speeds, he said. Secondly, they want stronger oversight of the contract requirements, because the Department of Information Technology and Telecommunications is currently able to waive various contract requirements like maintenance schedules. Third, the officials want the advertising revenue to be public. They also want the process to include community input the way the Department of Transportation held several meetings in different neighborhoods to decide where to put Citi Bike racks. And lastly, the designs should include more resiliency features, officials said. “Access to high-speed Internet cannot be based on the presumed advertising revenue available in any given neighborhood” said Bronx Borough President Ruben Diaz Jr.
“Every community must be connected to the information superhighway, in an equitable fashion, so we can make sure no New Yorker is left behind as we travel towards progress,” said Brooklyn Borough President Eric Adams. Manhattan borough president Gale Brewer, a longtime supporter of greater Internet access, said in a press release there should be more kiosks in major business districts, and high speeds even without advertising. Queens borough president Melinda Katz also called for more community input. At the payphone-Wi-Fi plan announcement, counsel to the mayor Maya Wiley said they did not think some neighborhoods would not attract advertising, leading to inequality in speeds. Additional reporting by Shannon Liao.